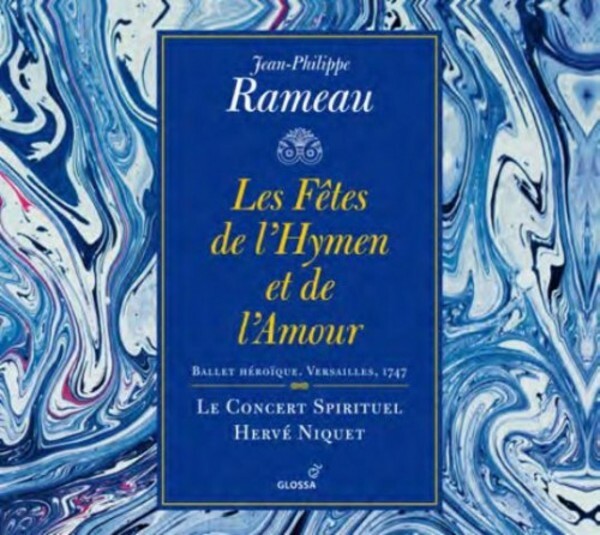 The latest in Hervé Niquet's 'reinvigorations' of French operatic music from the Baroque and beyond for Glossa is Rameau’s 1747 'Les Fêtes de l’Hymen et de l’Amour'. A ballet heroïque in a prologue and three entrées, the whole work was designed to comprise a complete theatrical spectacle. Music for dancing – as befits a ballet – is given a prominent role and Rameau is able to create especially expressive symphonies and to give the choruses – even a double-chorus – an integral role in the action. Added to this are supernatural effects, and plots for the entrées which explored the then uncommon world of Egyptian mythology (including a musical depiction of the flooding of the River Nile). In his vocal music Rameau deftly switches between Italianate style and the French mode, current in the mid-18th century, allowing the distinguished team of vocal soloists to demonstrate their accomplished talents. Overseen by the Centre de musique baroque de Versailles, and with booklet notes from Thomas Soury, this new recording is an important addition to the Rameau catalogue – the more so in the 250th anniversary year of the composer’s death. It brings to life one of Rameau’s finer, if underrated, compositions, and a dramatic work written on the cusp of important reforms in opera.